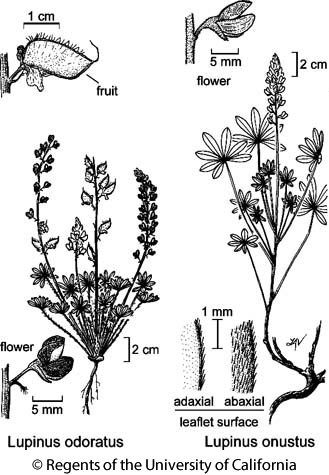 Habit: Annual 1--3 dm, sparsely short-hairy in youth, glabrous at flower; cotyledons disk-like, persistent. Leaf: basal; petiole 2--12 cm; leaflets 7--9, 10--20 mm, 3--8 mm wide, occasionally obovate, bright green. Inflorescence: 4--13 cm, flowers spiraled; peduncle 6--15 cm; pedicels 3--5 mm; bracts 2--4 mm, straight, persistent, tips sparsely ciliate. Flower: with violet odor, 7--10 mm; calyx tips generally glabrous (ciliate), upper lip 3--3.5 mm, rounded or 2-toothed, lower 4--5 mm; petals deep blue-purple, banner spot white or yellow, in age magenta, keel glabrous. Fruit: 1.5--2.5 cm, +- 8 mm wide, oblong, upper suture wavy, densely long-ciliate, sides glabrous or hairs few, short, when dry scale-like. Seed: 2--6, wrinkled. Ecology: Sandy flats, open areas; Elevation: < 1600 m. Bioregional Distribution: GB, D; Distribution Outside California: Nevada, Arizona. Flowering Time: Apr--May Note: May be confused with Lupinus flavoculatus. Unabridged Note: If recognized taxonomically, plants with sparsely hairy peduncles, petioles, abaxial leaf surfaces assignable to Lupinus odoratus var. pilosellus C.P. Sm. Citation for this treatment: Teresa Sholars & Rhonda Riggins 2012, Lupinus odoratus, in Jepson Flora Project (eds.) Jepson eFlora, http://ucjeps.berkeley.edu/eflora/eflora_display.php?tid=31987, accessed on April 20, 2019. GB, D; Markers link to CCH specimen records. Yellow markers indicate records that may provide evidence for eFlora range revision or may have georeferencing or identification issues. Purple markers indicate specimens collected from a garden, greenhouse, or other non-wild location.